Product #46251 | SKU PKTU31-512SK | 0.0 (no ratings yet) Thanks for your rating! 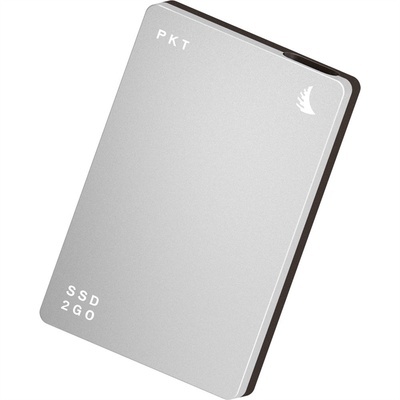 The silver 512GB SSD2go PKT USB 3.1 Type-C External Solid State Drive from Anglebird is a small portable solid state drive for users on-the-go. It features a hard anodised surface and because solid state drives have no moving parts, it's more resistant to physical impact and vibration than regular hard drives. Access and transfer files quickly with read speeds of up to 560 MB/s and write speeds of up to 460 MB/s. In addition, it will work with Windows, Mac, Linux, and Android and connects to your system via a USB 3.1 Type-C interface that supports data transfer rates of up to 10 Gb/s. While the SSD2go PKT is equipped with a USB Type-C interface and includes a USB Type-C cable, it also includes a USB Type-A cable, allowing it to be used with devices that are compatible with USB Type-A. Additionally, it is also compatible with USB 3.0 at speeds up to 5 Gb/s and USB 2.0 and speeds up to 480 Mb/s. This drive uses Grade A MLC NAND and also features overload protection, TRIM and SMART support (depending on the OS), as well as EMS and ESD protection. Additionally, it supports up to 62,000 IOPS, an access time of ~ 0.5 ms, and an MTBF of 2 million hours. This SSD is bus powered, meaning that it requires no external power supplies and is ideal for users who need fast performance in a pocket-sized form factor. Also included is an activation code for additional free software licences and content. To save you time and help you manage multimedia content, Angelbird has some downloadable software available on their website. Bitwig 8-Track: Music Production software for Windows, Mac OS X and Linux. Full version included. Parallels is fully functional but time-limited.